Search and rescue crews attend a memorial service in front of the Murrah Federal Building in Oklahoma City on May 5, 1995. 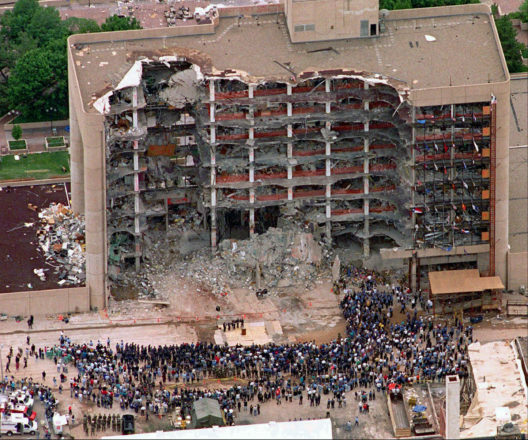 The bombing by domestic terrorist Timothy McVeigh killed 168 people and injured 680. To build our Homegrown Terror database, we obtained data from a variety of sources: the Congressional Research Service, the FBI, DT Analytics, The Heritage Foundation, the Investigative Project on Terrorism, New America, Mother Jones, the Muslim Public Affairs Council, the Southern Poverty Law Center, the Anti-Defamation League, the National Abortion Federation and the Animal Liberation Front’s own website. In addition, we set up news filters and searched journalism databases to scoop up missing incidents, using search terms such as “Islamist,” “sovereign citizen,” “Oath Keeper,” “ecoterrorism” and so on. Through public databases and Freedom of Information Act requests, we collected primary court and law enforcement documents for almost every incident and carefully examined them, in combination with credible news coverage, to check whether each entry met the FBI criteria that define domestic terrorism. Incidents that met the definition were included, regardless of whether prosecutors filed terrorism charges. Some incidents inevitably involved judgment calls. To adjudicate those, we turned to a panel of experts: William Banks, director of the Institute for National Security and Counterterrorism at the Syracuse University College of Law; Bruce Hoffman, director of the Center for Security Studies at Georgetown University; and Daryl Johnson, former senior domestic terrorism analyst at the Department of Homeland Security’s Office of Intelligence and Analysis, now the owner and CEO of consulting firm DT Analytics. They provided guidance on whether to include or exclude borderline cases, such as those related to hate crimes, mental illness and confrontations with law enforcement. In cases of mental illness, we excluded incidents only if there was no clear ideological motivation for the crime. With regard to police shootouts, we included incidents in which the targeting of police resulted from an ideological motivation. As one of our experts said, “Extremist belief systems cause individuals to be ‘attack-oriented’ rather than ‘escape-oriented,’ to use violence to attack or confront authority figures rather than flee or submit to them.” Hate crimes were included only when the perpetrator used a terrorist tactic or technique, such as an explosive device, firebomb or mass shooting. Lastly, a note on terminology: We use the loose umbrella term “left wing” to refer to a broad range of ideologies, including animal rights, environmental and anti-racist extremists. We use the umbrella term “right wing” to encompass militia movements, as well as white supremacist, anti-government, anti-Muslim, anti-immigrant and anti-abortion extremists, including radical Christians. We use the term “Islamist” to describe theocratic extremists inspired by groups such as the Taliban, al-Qaida and the Islamic State. We chose the term “Islamist,” rather than “Islamic,” in an effort to uncouple the Muslim faith from the political ideology of Islamism.